Visual evidence of deterioration is often apparent in the form of cracking and spalling of the concrete surfaces. However, an experienced, specialist engineer can often recognise more subtle evidence before the appearance of more severe defects. The spalling of cover concrete may be an obvious visual clue to the current condition of the reinforcement and substrate, although the quantification of such visual defects does not always allow for the underlying latent problems. 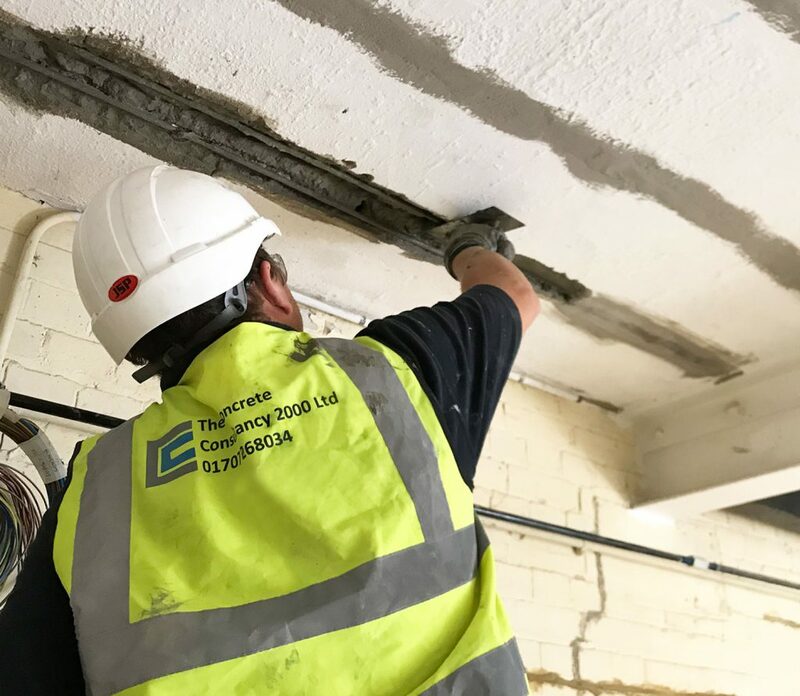 The expansive pressure caused by reinforcement corrosion products may produce localised hollow spalls with no obvious debonding of cover at the time of inspection. Where necessary a sounding hammer should be used to confirm the extent of visual defects. The depth of cover to reinforcement is vital to establish the general trends in the construction techniques employed as well as giving indications of quality control and design. Covermeter depth measurements are carried out in accordance with BS 1881: Part 204: 1988 guidelines. The recording of maximum and minimum cover depths allows the interpretation of the relevance of carbonation depths and moisture or chloride ingress. When cast, the alkali nature of the concrete offers adequate protection to the reinforcing within, however as the pore water within the surface matrix evaporates, carbon dioxide diffuses from the atmosphere to form a mild acid. The acid negates the effects of the alkali and so the protection to the reinforcement is lost. 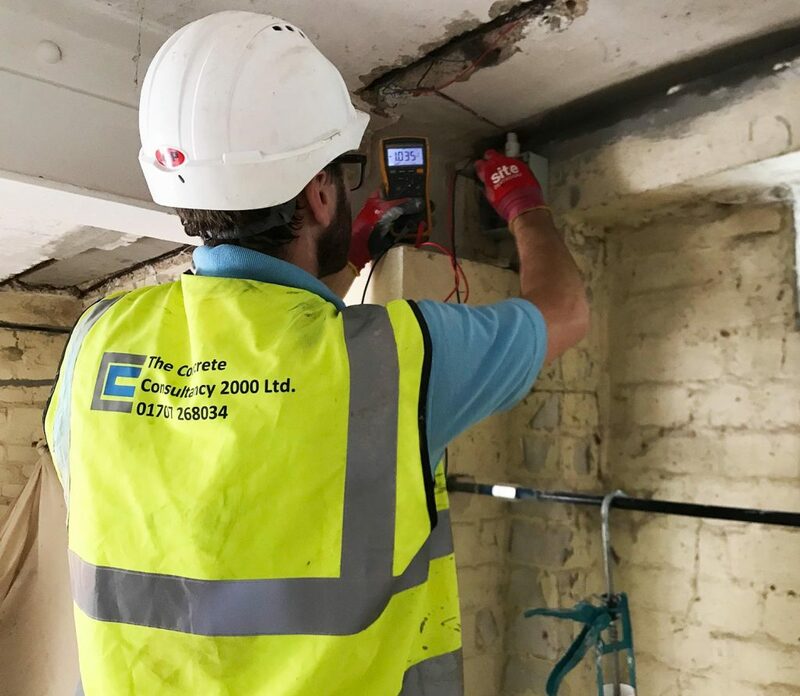 Carbonation depth measurements are made in accordance with BRE information paper IP 6/81 by spraying phenolphthalein, on freshly broken concrete. The mean depth of carbonation is measured as the distance between the concrete surface and the boundary of the uncoloured zone. The Assessment of fire damage is carried out in line with the Concrete Society Technical Report No. 68 and includes both on site and laboratory based techniques to fully assess the significance of any extreme heat and correctly specify concrete repairs. The laboratory analysis of concrete samples is essential to identify the presence of any contaminants or additives and allow the production of durable specifications for concrete repair. Further analysis or test methods may be used in identifying areas most susceptible to deterioration as well as the confirmation of material strength and composition. 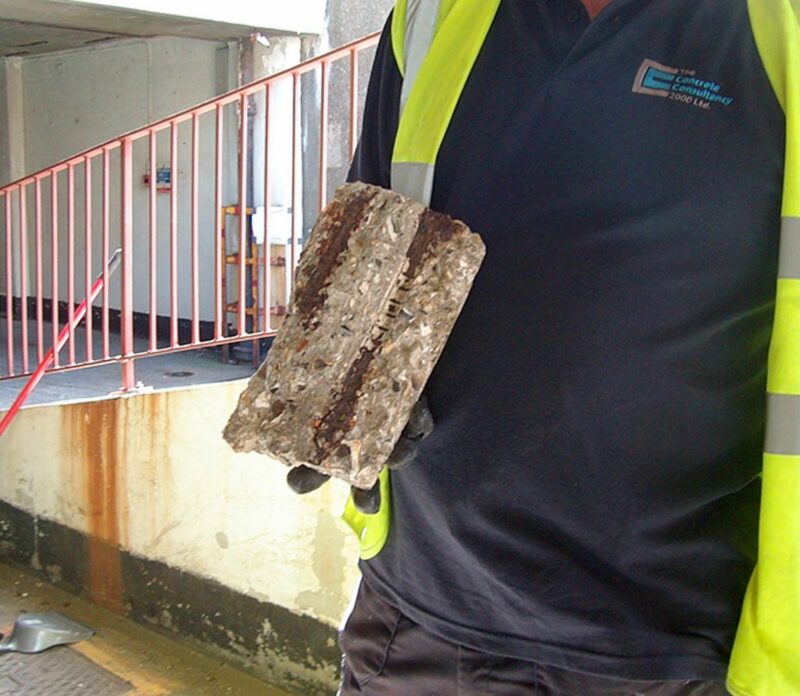 The determination of the presence of chlorides in any reinforced concrete structure is crucial to the selection of the correct specification for repair. The presence of chlorides in coastal structures is normally due to water or wind-blown ingress, however many inland concrete structures suffer from the problems caused by chloride attack on reinforcement due to the ingress of de-icing salts, or the inclusion of Calcium Chloride during casting. The current recognised threshold for chloride induced corrosion is 0.35 to 0.40% chlorides by weight of cement. Determination of Chloride from dust samples should be by a UKAS accredited laboratory, in accordance with BS 1881: Part 124: 2015. HAC differs from Portland cement, being composed of calcium aluminates rather than calcium silicates. Its rapid strength development made HAC popular for precast concrete in the UK during the 1960s. Mineralogical ‘conversion’ however, sometimes caused catastrophic reductions in concrete strength and increased vulnerability to chemical degradation. Three UK roof collapses in the mid-1970s led to widespread inspection and monitoring of HAC concrete units, exhaustive research and curtailment of HAC use for structural purposes. A large stock of UK buildings containing HAC concrete remains, in which the HAC is now usually highly converted. Whilst the probability of sudden collapse is now perhaps remote, there is continuing concern over long-term durability, particularly where carbonation has occurred to the depth of steel reinforcement. Analysis of samples for HAC should be carried out by a UKAS accredited laboratory in accordance with BRE IS 15/74. Steel embedded in good quality concrete is protected by the high alkalinity pore water, which, in the presence of oxygen passivates the steel. The loss of alkalinity due to carbonation of the concrete or the penetration of chloride ions arising from marine or de-icing salts can destroy the passive film. In the presence of moisture and oxygen corrosion of the steel occurs. A characteristic feature of the corrosion of steel within concrete is the formation of macro cells; that is the coexistence of two areas of different electric potential appearing on the same steel surface. This forms a short-circuited galvanic cell, with the corroding area as the anode and the passive area the cathode. The current flow in the concrete is accompanied by an electric field which can be measured at the concrete surface, resulting in equipotential lines that allow the location of the most active corrosion to be identified by the most negative potentials. This is the basis for potential mapping which has become a technique applied to the inspection of reinforced concrete structures and detailed within ASTM C876–09. According to the ASTM method, corrosion can only be identified with 95% certainty at potentials more negative than -350 mV. Experience has shown, however, that passive structures tend to show values more positive than -200 mV and often positive potentials. Potentials more negative than -200 mV may be an indicator of the onset of corrosion. The removal of core samples for laboratory analysis allows a wide range of definitive data to be obtained, the aggregate type, size, positioning and condition may be crucial to the overall repair recommendations. Similarly, the level of compaction and water cement ratio play an integral part of the overall assessment procedure. In addition, the use of an electron microscope allows the cement paste composition to be analysed in depth, with the effects of carbonation and chloride migration being able to be plotted precisely against reinforcement depth. The effects of heat transfer through cover concrete as a result of fire are clearly identifiable using core samples and laboratory analysis, where site based procedures are less concise. The overall compressive strength of the concrete may also be determined by crushing the sample in accordance with Compressive strength–BS EN 12504-1 and BS EN 12390. 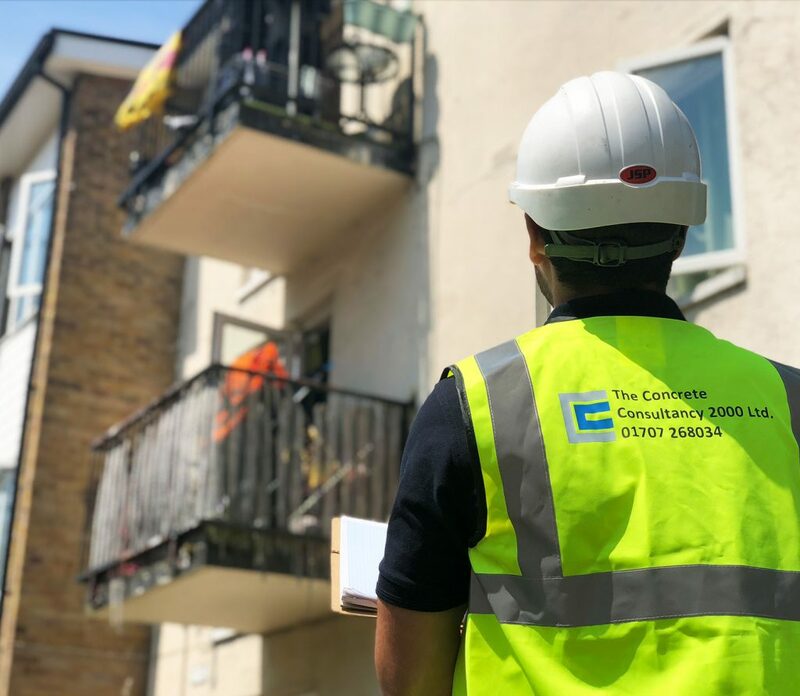 Using IRATA trained specialist roped access operatives a full survey and making safe works may often be undertaken to the most challenging structures at a fraction of the cost of other access methods. The removal of loose and hazardous concrete can be undertaken as a cost effective means of immediately reducing risk. In many cases, an initial visual inspection may be offered using the latest Drone Technology. This allows the identification of areas of concern or potential risk, eliminating the need for more expensive specialist access. 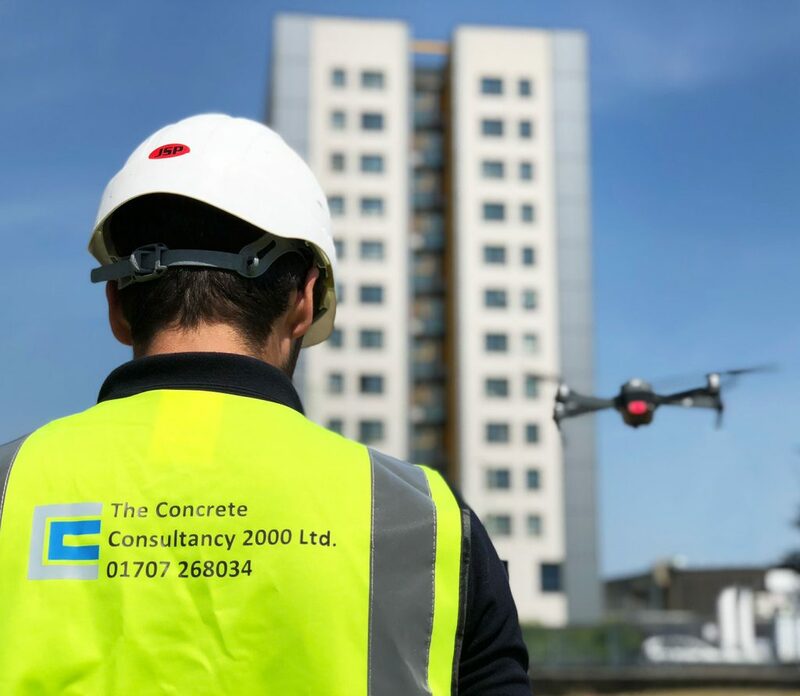 Deterioration initially identified during a drone survey can then be assessed to determine whether further, more intrusive investigation is required. In many instances, the close inspection and testing of reinforced concrete structures give enough detailed information to allow the preparation of an accurate cost for repairs based on a lump sum, fixed price with no re-measurement. This gives many clients a unique level of comfort when undertaking essential works or calculating budgets available for repairs.